Despite a lengthy editing process, a copy editor, and a proofreader, there are invariably typos and other mistakes in a book of this size. If you find further errors or want to suggest changes or corrections, post a message to Paul Gipe. Your help to make Wind Energy for the Rest of Us as error free as possible is appreciated. All page numbers refer to the print version. Page 57. Figure 4-7. MAN WKA 60. Würst is mispelled. It should be Wurst in the singular. Apparently my German isn't up to the task here and again on page 412. Page 78, South of the Border (Enercon) sidebar. Herr Wobben’s first name is misspelled. It is correct, Aloys, elsewhere. Page 148. FloWind description top-right column. 17-meter rating reversed with 19-meter rating. 17-meter is 44 mph, 19-meter is 38 mph. Table 6-1 is correct. Page 169. Figure 6-31. Tip Speed Ratio, not Ration. Page 193. Figure 8-3. The colors in the legend are reversed. This is correct in the digital version. Page 256. Corrected text. First para. following Figure 11-3. Compare the annual specific yield in Table 11-2 with that in Table 11-1 for an average annual wind speed of 6 m/s: 400 kWh/m²/yr to 570 kWh/m²/yr. The new, high-performance household-size turbines are nearly 50% more efficient at capturing the energy in the wind than those wind turbines available in the 1990s represented in Table 11-1. Page 476. Table 19-11. Turbine on table title is misspelled as Turbone. This is correct in the digital version. Page 539. Selected Sources. Unfortunately, URLs change frequently. There are a number of broken links in the print version. These have been corrected in the digital version and were accessed in December 2016. Haka, Andreas. “Flügel aus ‘Schwarzem Gold’: Zur Geschichte der Faserverbundwerkstoffe.” NTM Zeitschrift für Geschichte der Naturwissenschaft, Technik und Medizin 19, no. 1 (2011): 69–105. Accessed November 3, 2014. http://download.springer.com/static/pdf/482/art53A10.100752Fs00048-011-0047-4.pdf?auth66=1415044741_27ff94a3a857774ab8acf69d2c09ecf0&ext=.pdf. NREL. “Mariah Power’s Windspire Wind Turbine Testing and Results.” National Renewable Energy Laboratory. Accessed October 31, 2014.www.nrel.gov/wind/smallwind/mariah_power.html. Enercon. “Rotor sail ship ‘E-Ship 1’ saves up to 25% fuel.” Enercon: Energy for the World. Accessed November 5, 2014.www.enercon.de/p/downloads/PM_E-Ship1_Ergebnisse_DBU_en.pdf. Phillips, Derek Grant, R. G. J. Flay, and Trevor Nash. “Aerodynamic analysis and monitoring of the Vortec 7 diffuser -augmented wind turbine.” IPENZ Transactions 26, no. 1/EMCH (1999): 13–19. Accessed November 4, 2014.www.ipenz.org.nz/ipenz/publications/transactions/Transactions99/EMCh/Phillips.PDF. The link is broken. This is the new link. DeCarolis, Joseph F., and David W. Keith. “The Costs of Wind’s Variability: Is There a Threshold?” The Electricity Journal 18, no. 1 (January/February 2005): 69–77. Accessed November 1, 2014. http://keith.seas.harvard.edu/papers/72.Decarolis.2005.Threshold.e.pdf. Dena Project Steering Group. “Summary of the Essential Results of the Study, Planning of the Grid Integration of Wind Energy in Germany Onshore and Offshore up to the Year 2020 (Dena Grid study).” Deutsche Energie-Agentur, Berlin, March 15, 2005. Accessed November 1, 2014.www.dena.de/fileadmin/user_upload/Publikationen/Energiedienstleistungen/Dokumente/dena-grid_study_summary.pdf. Gross, Robert, Philip Heptonstall, Dennis Anderson, Tim Green, Matthew Leach, and Jim Skea. The Costs and Impacts of Intermittency: An assessment of the evidence on the costs and impacts of intermittent generation on the British electricity network. Report of the Technology and Policy Assessment, UK Energy Research Centre, London: UKERC, March 2006. ISBN 1 90314 404 3. Accessed November 1, 2014.www.ukerc.ac.uk/Downloads/PDF/06/0604Intermittency/0604IntermittencyReport.pdf. Pape, Carsten. “Scenarios with High Shares of Renewable Energies.” Fraunhofer Institut für Windenenergie und Energiesystemtechnik. Presentation to the Ontario Sustainable Energy Association, Kassel, Germany July 2012. 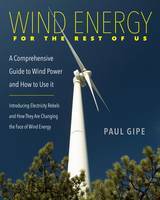 Accessed May 11, 2016. http://www.wind-works.org/cms/index.php?1d=91. Clark, Nolan R., Vaughn Nelson, Robert E. Barrieu, and Earl Gilmore. “Wind Turbines for Irrigation Pumping.” Journal of Energy 5, no. 2 (March–April 1981): 104–105. Accessed November 1, 2014. www.cprl.ars.usda.gov/pdfs/1981.Clark,R.N.,andV.Nelson,andR.E.Barieau,andE.G.pdf. Atkinson-Palombo, Carol, and Ben Hoen. Relationship between Wind Turbines and Residential Property Values in Massachusetts. Joint report of University of Connecticut and Lawrence Berkeley National Laboratory. Boston, January 9, 2014. Accessed November 1, 2014.http://images.masscec.com/uploads/attachments/2014/06/RelationshipbetweenWindTurbinesandResidentialPropertyValuesinMassachusetts.pdf. Barnard, Mike. “Property Values Not Hurt by Wind Energy.” Energy and Policy Institute, April 2014. Accessed November 1, 2014.www.energyandpolicy.org/tags/property_values. Blanca, Palomo, Claire Michaud, and Bastien Gaillardon. “Life Cycle Assessment of a French Wind Plant.” JEC Composites Magazine 90 (June/July 2014). Accessed November 1, 2014. rescoll.fr/blog/wp-content/uploads/2014/03/LCA-French-plant-Full-Paper.pdf. Chapman, Simon, Alexis St. George, Karen Waller, and Vince Cakic. “Spatio-temporal differences in the history of health and noise complaints about Australian wind farms: evidence for the psychogenic, ‘communicated disease’ hypothesis.” PLoS ONE 8, no. 10 (October 16, 2013). Accessed December 31, 2015. DOI:10.1371/journal.pone.0076584. journals.plos.org/plosone/article?id=10/371/journal.pone.0076584. Elsam. “Life Cycle Assessment of offshore and onshore sited wind farms.” Elsam Engineering A/S, translated by Vestas Wind Systems, October 20, 2004, page 40. Accessed November 2, 2014. www.vestas.com/filesFfilerFenFsustainabilityFlcaFlca_v80_2004_uk.pdf. Gipe, Paul. 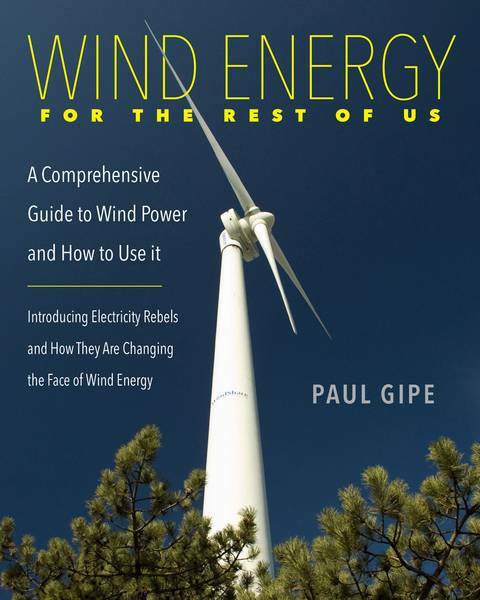 “Public Acceptance of the Potato and What It Tells Us about the Acceptance of Wind Energy.” Wind-Works, March 7, 2013. Accessed November 1, 2014. www.wind-works.org/cms/index.php?id=43&tx_ttnews[tt_news]=2228&cHash=5b7218c411b6f7b571d6575df8b8532f. Greenpeace. “Koch Industries: Secretly Funding the Climate Denial Machine.” Greenpeace. Accessed November 11, 2014.www.greenpeace.org/usa/en/campaigns/global-warming-and-energy/polluterwatch/koch-industries/. Hoen, Ben, Ryan Wiser, Peter Cappers, Mark Thayer, and Gautam Sethi. “The Impact of Wind Power Projects on Residential Property Values in the United States: A Multi-Site Hedonic Analysis.” Lawrence Berkeley National Laboratory, December 2009. Accessed November 1 2014.emp.lbl.gov/sites/all/files/REPORTlbnl-2829e.pdf. Howe, Brian. “Low Frequency Noise and Infrasound Associated with Wind Turbine Generator Systems: A Literature Review.” Ontario Ministry of the Environment, December 10, 2010. Accessed November 2, 2014. http://tinyurl.com/zl4xym3. Moomaw, William, Peter Burgherr, Garvin Heath, Manfred Lenzen, John Nyboer, and Aviel Verbruggen. “Annex II: Methodology.” In IPCC Special Report on Renewable Energy Sources and Climate Change Mitigation. Cambridge, UK, and New York: Cambridge University Press, 2011. Accessed November 1, 2014. srren.ipcc-wg3.de/report/IPCC_SRREN_Annex_II.pdf. Public Health Division. The Strategic Health Impact Assessment on Wind Energy Development in Oregon. PHD, Oregon Health Authority, March 2013. Accessed November 2, 2014.public.health.oregon.gov/HealthyEnvironments/TrackingAssessment/HealthImpactAssessment/Documents/WndEnergyHIA/WindHIA_Final.pdf. RenewableUK. The effect of wind farms on house prices. RenewableUK & Cebr study, March 2014. Accessed November 1, 2014.www.renewableuk.com/en/publications/index.cfm/RenewableUK-Cebr-Study-The-effect-of-wind-farms-on-house-prices. Sathaye, J., O. Lucon, A. Rahman, J. Christensen, F. Denton, J. Fujino, G. Heath, S. Kadner, M. Mirza, H. Rudnick, A. Schlaepfer, and A. Shmakin. “Renewable Energy in the Context of Sustainable Development.” Chap. 9 in IPCC Special Report on Renewable Energy Sources and Climate Change Mitigation. Cambridge, UK, and New York: Cambridge University Press, 2011. Accessed November 1, 2014. srren.ipcc-wg3.de/report/IPCC_SRREN_Ch09.pdf. International Energy Agency. Environmental Health Impacts of Electricity Generation: A Comparison of the Environmental Impacts of Hydropower with those of Other Generation Technologies. IEA Hydropower, June 2002. Accessed November 2, 2014. www.ieahydro.org/reports/ST3-020613b.pdf. Bund für Umwelt und Naturschutz Deutschland (BUND). “Volle Kraft voraus! Für die ökologische Energiewende von unten.” Brochure, modified March 2014. Accessed November 3, 2014.www.bund.net/fileadmin/bundnet/publikationen/energie/130429_bund_klima_energie_volle_kraft_voraus_energiewende_von_unten.pdf. Nestle, Uwe. “Marktrealität von Bürgerenergie und mögliche Auswirkungen von regulatorischen Eingriffen.” Bündnis Bürgerenergie e.V. (BBEn) und dem Bund für Umwelt und Naturschutz Deutschland e.V. (BUND), Leuphana Universität Lüneburg, Institut für Bank, Finanz, und Rechnungswesen, April 2014. Accessed November 3, 2014. www.bund.net/fileadmin/bundnet/pdfs/klima_und_energie/140407_bund_klima_energie_buergerenergie_studie.pdf. Vass, Tiffany. “The influence of local project initiation, participation, and investment on local perceptions of small-scale wind energy projects in Nova Scotia.” Dalhousie University, Halifax, Nova Scotia, March 2013. Accessed November 2, 2014. //sites.google.com/site/nswindenergystudy/. Westmill Wind Farm Co-operative website. Accessed November 2, 2014. www.westmill.coop/westmill_home.asp.